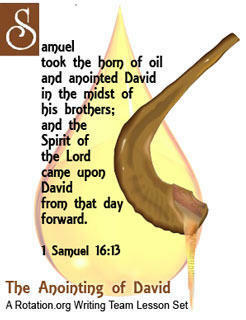 "Anointing of David" Lesson Set! Many the lesson plans in this David Team Set are open to the public. Some are only open to Supporting Members. Normally, all Writing Team lesson plans are only open to Supporting Members. Become a Supporting Member today! (WT) Anointing of David ~ Art Workshop 1: "Inside Out Boxes"
(WT) Anointing of David ~ Art Workshop 2: Making a "Triptych"
Anointing of David is another great lesson set from the Rotation.org Writing Team. In addition to the Bible Background and Lesson Summary pages, we've left about HALF of the lesson plans open to the public in this particular WT set! Supporting Members have access to all the lesson plans. Become a Supporting Member today.